Brock Holt is good again? Brock Holt is good again. 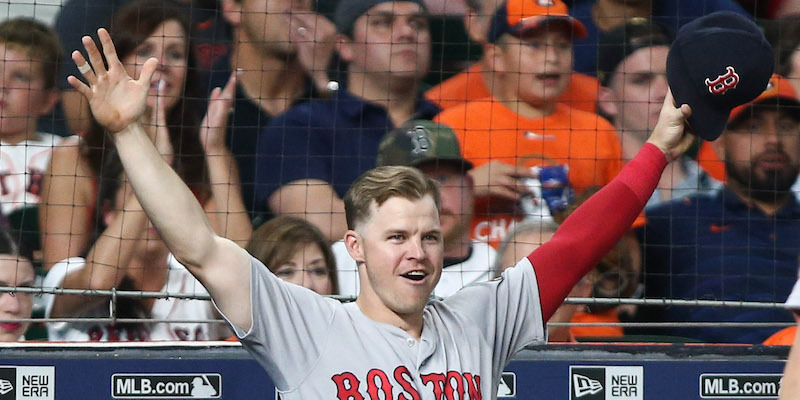 In one of the biggest — and quite frankly, most helpful — surprises of the Red Sox’ first half, it certainly does seem like Brock Holt is actually good again. He’s hitting .298/.370/.433 with a .802 OPS, good for a .299 TAv. That also happens to be the best TAv of his career, up 85 points from his (admittedly disappointing) 2017 campaign. The thing that jumps off the page is just how good Holt’s been this year. He’s not just improving on last year’s dismal numbers — he’s legitimately been a very, very good MLB player through the first eight weeks of the season. Any discussion of Holt’s resurgence should probably start with his health. Head injuries are gravely serious, and Holt’s concussion struggles last year sounded like absolute hell. At one point, he was apparently advised to play through the symptoms which — and I’m no doctor — seems like a terrible idea? They were bad enough to keep him out for large chunks of 2017, and he only ended up 164 plate appearances. Some context: he’s already at 107 plate appearances this year. Being clear of the constant struggles that come with concussions must feel like new life for Holt. He certainly looks approximately one billion times happier this year. On the field, however, it’s not immediately clear what, if any, adjustments he’s made. His batted-ball profile isn’t dramatically different — there’s some slight variation in the three types of contact he’s making, but nothing in the range of more than four percentage points. His exit velocity (86.2) has stayed consistent with what it’s always been, and his launch angle is still laughably low. In a time when it seems like any and every hitter’s resurgence is tied to putting the ball in the air, Holt is defying that norm. One thing that is clear is that he’s been much more patient at the plate. He’s drawing walks at a 10 percent clip and while that’s slightly down from last year (11.6), it’s still only the second time in his career that his walk rate is in the double digits. He’s also cut his strikeouts down significantly, lowering his strikeout rate six percentage points from last season. If he stays steady at 14 percent, it would represent the best clip since 2013, when he only appeared in 26 games. For all intents and purposes, Holt is having the most disciplined year of his career at the plate. Because I’m devoid of any real joy, I’ll point out there are some things to be wary about. Holt’s running a .345 BABIP right now, significantly higher than the league average of .294. The good news is that Holt’s always been a high-BABIP type of guy, posting better than league-average BABIP marks in four of his seven seasons. And even with a career .325 clip in that department, his current pace is more than likely not sustainable. There’s also the fact that Holt’s notoriously a first-half hitter. For his career, he’s slashed .295/.362/.416 with a .780 OPS in the first half and .238/.300/.310 with a .611 OPS in the second. Not once has he ever had a better second half offensively in any given year than he had in the first. Health aside, there’s most likely a dip coming. We’ll cross that bridge when we get there though. Brock Holt is good again, and watching him fly around the field hugging people has been one of the biggest joys of what’s been a pretty fun season so far. Brock Holt is good again? Brock Holt is good again.